Two Chinese astronauts closed out a month in space Friday with a parachute-assisted landing in northern China’s remote Inner Mongolia territory, a day after the crew departed the Tiangong 2 space lab to begin the trip home. The two-man team finished their experiments this week, a slate of tests and investigations aimed at a range of scientific and engineering disciplines, and cleaned up the Tiangong 2 module before closing hatches leading to their Shenzhou 11 space capsule, the ship they flew into space Oct. 16 atop a Long March 2F rocket. Shenzhou 11 detached from the Tiangong 2 space lab at 0441 GMT Thursday (11:41 p.m. EST Wednesday), then headed for landing in Inner Mongolia’s Siziwang Banner region. The capsule touched down at 0559 GMT (12:59 a.m. EST; 1:59 p.m. Beijing time) Friday, according to China’s state-run Xinhua news agency. “Shenzhou 11 has landed successfully, and the two astronauts are all in good shape, and I would like to declare the mission of Tiangong 2 and Shenzhou 11 has achieved a complete success,” said General Zhang Youxia, chief commander of China’s human spaceflight program. Jing Haipeng, the mission commander, wrapped up his third mission after setting the record for the most cumulative time in space by a Chinese citizen with 47 days. Crewmate Chen Dong concluded his first spaceflight. Both are Chinese Air Force pilots selected for the country’s astronaut corps. The astronauts came back to Earth after completing China’s longest piloted space mission to date, more than doubling the country’s previous mark. Shenzhou 11 was the sixth Chinese human spaceflight since the country’s first in 2005, when Yang Liwei went on a solo one-day voyage in Earth orbit. But Chen told Xinhua he was eager to come home and be reacquainted with Earth. The 32-day flight helped set the stage for China’s planned space station, which could have its centerpiece module launched as soon as 2018, with part-time astronauts visits beginning soon after. The final pieces of the research complex, which will include the core module, two science labs and ports to receive robotic cargo ships and crew capsules, should be in orbit by 2022. 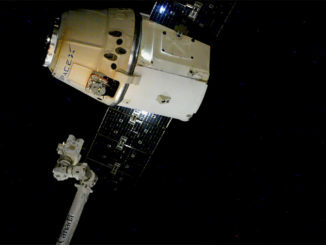 Once fully operational, the station will be able to host three astronauts for up to six months at a time, and perhaps six crew members for shorter durations. China’s Shenzhou spaceships are similar in design to Russian Soyuz spacecraft, with three major sections: a descent module housing the crew couches and cockpit controls, a habitation module containing living space, and a propulsion and commodities section with solar panels, rocket thrusters, and tanks for fuel, water and gases. But the Chinese ship is slightly larger than the Soyuz, stretching about 30 feet (9 meters) long with a solar array wingspan of 55 feet (17 meters). The Shenzhou 11 spacecraft fired its rocket engines around 0514 GMT (12:14 a.m. EST) Friday for a braking maneuver to drop out of orbit. The habitation section, positioned forward of the descent capsule, separated just before the deorbit burn. The propulsion module jettisoned soon after the burn’s end at 0535 GMT (12:35 a.m. EST) to burn up in Earth’s atmosphere. The landing capsule was covered with a protective heat shield. 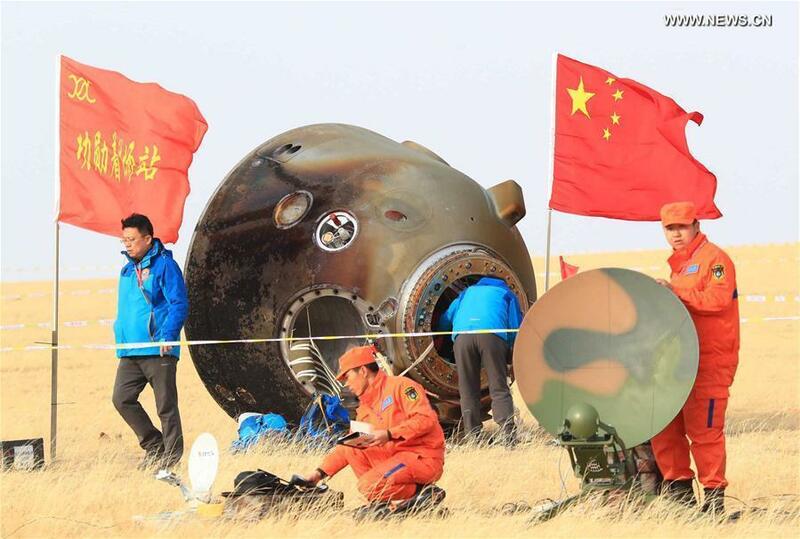 Once the capsule passed the hottest part of re-entry, it deployed a main parachute to slow down for the final descent to the Siziwang Banner landing zone in China’s Inner Mongolia autonomous region, the same area where all previous Shenzhou crews have returned home. 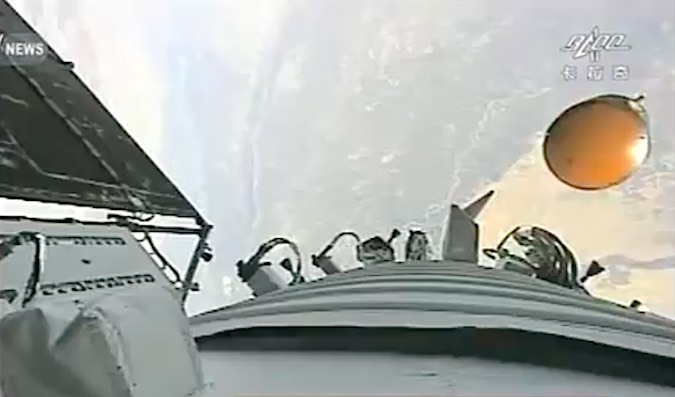 China’s government-operated CCTV television news channel broadcast the re-entry and landing live, showing dazzling views from a camera mounted outside Shenzhou 11 during its deorbit burn and on-board video of the ship’s modules disconnecting before re-entry. Infrared views from airborne cameras showed the spaceship streaking through the atmosphere, then gently descending suspended under its main parachute. The cameras lost their view of the Shenzhou 11 spaceship in hazy skies over Inner Mongolia, but live video coverage resumed soon after showing the capsule resting on its side in a field. Chinese recovery teams converged on the landing site via helicopter and all-terrain vehicles, and authorities reported the astronauts had already opened Shenzhou 11’s hatch on their own. 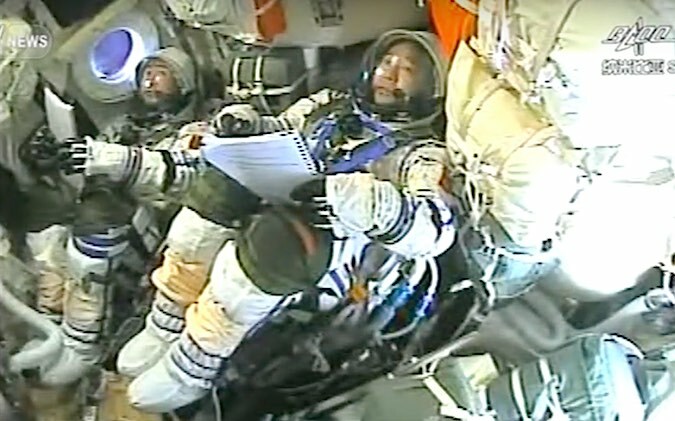 In a break from practice on previous Shenzhou missions, the live CCTV coverage ended before showing the astronauts getting out of their spacecraft. Jing and Chen launched Oct. 16 from the Jiuquan space center in northwest China’s Gobi desert. Their Shenzhou 11 spaceship made an automated docking with Tiangong 2, which launched a month earlier, on Oct. 18. 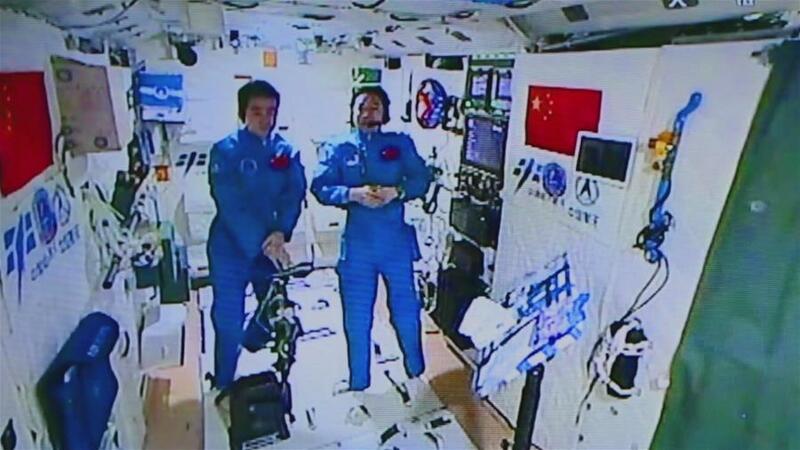 The duo lived and worked inside Tiangong 2 for a month, testing out exercise equipment, growing lettuce and subjecting their bodies to a regimen of sample collections and medical monitors to see how they responded to prolonged exposure to weightlessness, radiation and the rigors of spaceflight. The Shenzhou 11 capsule came home with many of the experiment results, carrying data cards, some of the vegetables grown in orbit, urine and saliva samples, and micro-organism specimens. Scientists on the ground will examine the materials, checking the lettuce for edibility and helping measure the physiological impacts of flying in space. The astronauts also returned with cocoons spun by silkworms on Tiangong 2 for an experiment designed and built by Hong Kong middle school students. The cocoons made in space will be compared to those spun by silkworms on the ground. The medical investigations during the Shenzhou 11 mission included checks of the astronauts’ cardiovascular and pulmonary function, bone and muscle mass, and eyesight to see if microgravity caused any degradation in their health. Other tasks on the month-long flight focused on proving new technologies required by the future Chinese space station, such as robotic systems, a treadmill and bicycle ergometer for exercise, a wide-band communications connection to Earth for live voice and video messages, and upgraded life support equipment. Before leaving Tiangong 2, Jing and Chen cleaned up the research lab and readied it for standalone operations. Tiangong 2 should continue its mission for at least two years, and Chinese engineers are preparing to send the country’s first automated cargo craft to the space lab in April. The Tianzhou 1 supply ship, similar to Russia’s Progress cargo freighters, will demonstrate refueling and resupply procedures to show that China can support and service a permanently-occupied space station. There are also more research experiments aboard Tiangong 2, including a payload named POLAR built to detect gamma-ray bursts, the most powerful explosions in the universe. Developed by scientists in China, Switzerland and Poland, the detector weighs about 70 pounds (30 kilograms) and will help astrophysicists resolve the origin of bright gamma-ray flashes emanating from distant galaxies. Scientists believe most gamma-ray bursts, which can vary in length from milliseconds to hours, occur during supernovas, when stars explode and leave behind a super-dense neutron star or black hole. “We hope to obtain accurate polarization information of the gamma-ray bursts for the first time ever to better understand the process of how the violent explosions happen,” said Zhang Shuangnan, principal investigator on the POLAR project and a chief scientist at the High Energy Physics Institute of the Chinese Academy of Sciences, in a report published by Xinhua. The schedule for China’s next human spaceflight mission has not been announced, but Chinese astronauts could start flying to the core module of the country’s next-generation space station by 2019. Other piloted Shenzhou missions could fly before then. China has announced its space station will be “fully open” for international cooperation, and officials from the European Space Agency and Russia have expressed interest in flying their astronauts on the Chinese outpost, which could ramp up to full capacity just as the International Space Station is decommissioned in the mid-2020s. NASA is restricted from direct cooperation with China in spaceflight. This month registered two big leaps forward for China’s planned space station program. 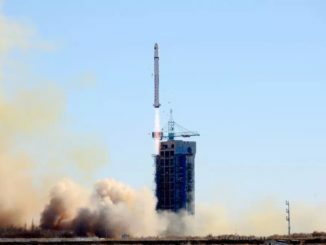 Besides the smooth end of the Shenzhou 11 mission, China’s new heavy-lift Long March 5 rocket succeeded on its first launch Nov. 3. 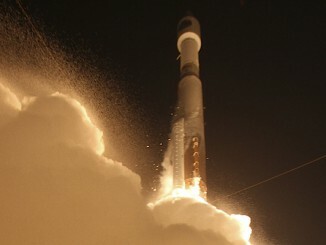 The Long March 5 is one of the most powerful rockets in the world, rivaling United Launch Alliance’s Delta 4-Heavy. China’s 20-ton space station modules will lift off on Long March 5 boosters, along with a robotic sample return mission to the moon next year, and a Mars rover due for launch in 2020.